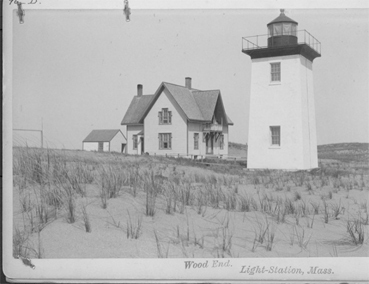 Wood End Light is located in beautiful Provincetown at the end of Cape Cod. 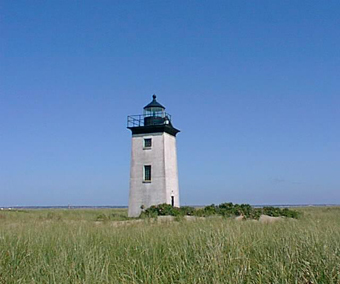 The first two lighthouses in the vicinity, at Race Point and Long Point, were built by 1826. By the 1860s, it was realized that another aid was needed at Wood End, the southernmost end of the curving spit of land that protected the harbor. A white pyramidal day beacon was first erected at Wood End in 1864. A 38-foot brick tower was erected, and the light went into service on November 20, 1872. A fifth-order Fresnel lens produced a red flashevery 15 seconds, 45 feet above the sea. A keeper's house was built about 50 feet northeast of the lighthouse. The first keeper, Thomas Lowe, remained at the station for 25 years. In spite of the three lighthouses around Provincetown, wrecks still frequently occurred. Lowe sometimes had to enlist the help of nearby townspeople, in the rescue of shipwreck victims. A lifesaving station had been established at Race Point in 1872, and one was finally added at Wood End in 1896, a short distance east of the Wood End lighthouse. In 1896, a new wood-frame keeper's house was built, along with a storage shed and a small brick oil house for the storage of kerosene. New machinery for the revolving lens was installed in 1900. Two years later, a 1,000-pound fog bell and bell tower were added near the lighthouse. In 1927 just before Christmas, the Navy submarine S-4 and the Coast Guard cutter Paulding, collided a half mile south of Wood End Light. 40 men on the S-4 succumbed to the sea in the acident. The S-4 was raised three months later and was used to help devise greater safety measures for future submarines. During a time of severe cold in February 1935, Keeper Douglas Shepherd was stranded at the lighthouse station for weeks. Ordinarily, Shepherd made a daily trip into town. He had no worries despite his isolation because the Coast Guard kept him in touch with the mainland during that time. The lighthouse was automated in 1961 and all the other buildings except the oil house were destroyed. The lighthouse's original lens had been replaced by a fifth-order lens in 1916, and this was replaced by a modern optic when the light was automated. The light was converted to solar power in 1981. The Cape Cod Chapter of the American Lighthouse Foundation has been licensed by the Coast Guard to restore and maintain Wood End Light. Volunteers painted the tower and oil house in the fall of 2000 and spring of 2007. The Wood End Light is not open to the public, but the area around it can be reached if you walk across the breakwater built in 1911 (breaking waves sometime make the going tricky at high tide). It's a fairly tough walk of 30-45 minutes each way to the lighthouse. There are limited parking spaces available near the start of the walk; it's an additional walk of around 20-30 minutes from the center of town. The lighthouse, still an active aid to navigation and is also viewable from some of the excursion boats out of Provincetown like the whale watching and fishing trips. Return to Cape Cod Lighthouses from Wood End Light page.